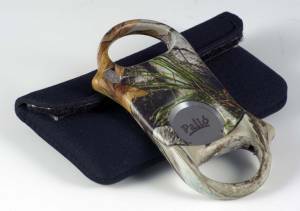 Palio Camo G1 Vista Cutter Discounts Apply ! Introducing the NEW Camo G1 Vista Palio Cutter! Stylishly crafted, the Palio is the ideal complement to your finest hand-rolled cigars. Crafted for the sophisticated connoisseur, the use of today's most refined cutter is a must for serious smokers. With Palio, you'll be assured that the finest cigars in your collection will be prepared accordingly. When in the company of colleagues, associates, or comrades, let Palio give you the cutting edge! Palio Cutters come with a nice nylon carrying case as well!